I appear to have inherited a love of lists from my dear husband. His love of lists results in him being hyper-organised. My love of lists results in me having a handbag full of pieces of paper. I did a lot of gymnastics and dancing as a child. As a result my body adores bending itself into crazy shapes. You don’t have to be bendy to do yoga though. In fact, it’s probably better that you aren’t. I have to be really careful that I don’t overbend and injure myself. As Iyengar says, “Begin where you are”. That’s the beauty of yoga, it’s your practice, it’s all about you! Ok, so this is kind of two. The yoga practice fosters calm and poise. Anyone who knows me will tell you I’m a complete nutcase and stress-head, but my yoga practice allows me to maintain perspective and to not sweat about the little things in life. Physically, I’ve always had an incredibly weak upper body, but over the last 6 months I’ve been focusing on strength and I’m starting to see some results. I find Chaturanga stupidly difficult, but perseverance is the key! In order to balance gracefully your mind needs to be completely free of chitta, or thoughts, or chatter. There’s something wonderful about achieving a beautiful Tree Pose (Vrksasana)… letting your hands stretch up towards the sky and shooting all of your energy out of the crown of your head, honoring the nature around you. Most people have forgotten how to breathe. Yoga enables us to reconnect with the simple pattern of breathing, of properly filling the lungs and emptying the lungs. The breath is so powerful and knowing how to control it can transform your life. Hmm… this is more than one again! Take the time to really connect with yourself in the Virabhadrasana (Warrior) poses. Open the chest, reach for the sun or shoot the energy through your fingertips. Find the beauty and grace in the poses… you may not be the most poised person in real life, but take the time to explore the Warriors and you will feel A-mazing. At some point in the dim and distant past I owned a pair of UK size 20 Jasper Conran jeans. I am not exactly a double-00 now, but I do know that I don’t want to fill my body with crap from McDonald’s and Greggs anymore. 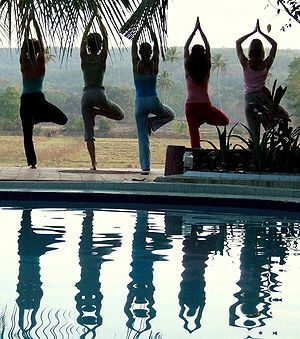 Yoga makes you choose a different way of life, it happens almost naturally. You stop thinking that ready-meals are food. You want to take better care of yourself and those around you. You begin to think about where your food comes from, where your laundry detergent ends up… how the smallest actions can make a difference. It’s not just about diet, it’s about living ethically. I know only too well that what I have to do on a daily basis is NOTHING compared to the things that the people around me have to do. HAVE to. It’s not like you have a choice. You HAVE to, otherwise the wheels fall off and everything starts running downhill, very fast. A regular yoga class gives you 1 hour and 30 minutes per week (or more if you attend more than one class) of pure Me Time. Seriously, ask yourself, how much Me Time do you actually have? Do the cats try to break down the door every time you go in the bath? Does the simple act of painting your nails evolve into ‘Art Time’ for various children and\or furry beings? That’s kind of how it is in my house. Taking time out for you means that you are stronger, more relaxed and better equipped to face the daily HAVE TO tasks. Yoga is amazingly powerful for your mental as well as your physical health. Be honest with yourself, when was the last time you laid on the floor and allowed yourself to think about nothing? That’s right, nothing! Have you ever tried not thinking? It’s not easy. Savasana is probably THE most powerful pose for the 21st century being. Surrender is not something that enters our vocabulary. In my classes there is always a long, relaxing Savasana at the end. I was once driven to a Sunday morning meditation by the vice-president of the company I then worked for. It was about -10 degrees C and we discussed upper body strengthening poses and he introduced me to what Dolphin is all about. Once at the venue he strummed his guitar whilst we were guided through a wonderful, profound meditation. I was as moved by this guy’s tender, holistic side as I was by the wonderful meditation experience that reduced me to tears. I met some amazing ladies and one gentleman on my yoga teaching course… from all walks of life. Every single one of them was inspirational in their own way. Hopefully I’ve made some friends for life. Ok, so hippy moment – I feel like yoga has given me the gift of life. Life seems more techni-colour. I appreciate the Canadian geese flying overhead on my way to work. I appreciate the sunrise through my bedroom window. Yoga teaches you to be mindful, to savour every bite of life. It’s yours for the taking and only you can make it happen. Yoga can help you reconnect with yourself and with the world around you. Check out my Classes page! Categories: Uncategorized | Tags: Iyengar, Savasana, Yoga | Permalink.